Children use the pulley swing at the Lincoln Children's Museum. The swing was designed and built by the University of Nebraska-Lincoln Theme Park Design Group. A new children’s museum attraction engineered by University of Nebraska–Lincoln students makes kids feel as strong as their favorite superheroes. 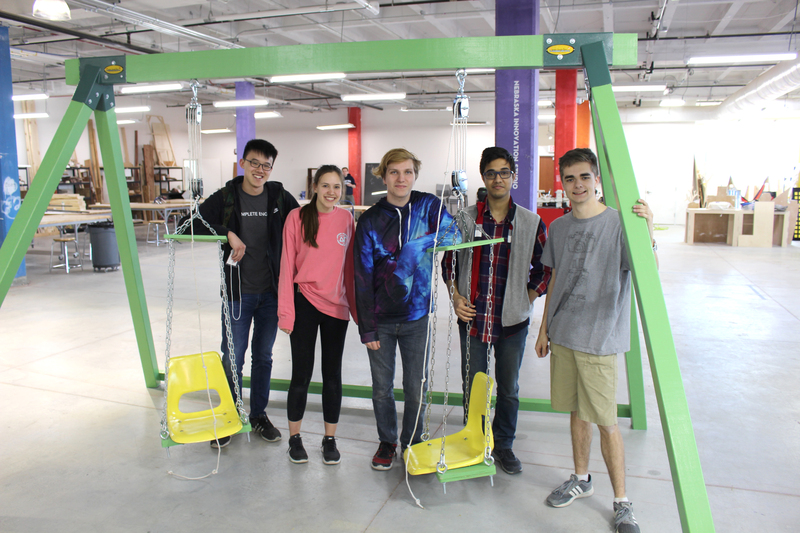 Undergraduate members of Nebraska’s Theme Park Design Group designed and built a green pulley swing set for the new Lincoln Children's Museum superheroes exhibit. Using the pulleys, the kids can pull themselves and others off the ground almost 2 feet, helping them imagine the feeling of having super strength. The students in the organization, which was started in fall 2017 by freshman mechanical engineering major John Strope of Mobile, Alabama, put in more than 150 hours over six weekends at Nebraska Innovation Studio to complete the project. Students (from left) Pinhao Cheng, Zoe Jirovsky, Daniel Webb and John Strope were among the group of undergraduates in the Theme Park Design Group who designed and built a new attraction for the Lincoln Children's Museum. Initially, Strope hadn’t thought about community service in the club, but after being contacted about the museum project by David Martin, director of Innovation Studio, the students jumped at the opportunity. Strope said they were excited to use the range of skills in the multi-disciplinary group, which boasts members from nearly every college on campus, for a community service project, and to see a finished product. Now, Strope said, he and other Theme Park Design Group members hope to make community service an annual tradition, along with the weekly meetings to discuss upcoming theme park design competitions and to learn about the many facets of building, designing and managing theme parks. Strope started the group after arriving at Nebraska, wanting to pursue a career in theme park design. He found a mentor in Michael Loehring, senior director of student services in the College of Engineering, who encouraged him to start the organization and serves as the faculty adviser. Strope quickly recruited 35 student members for the organization and has since made many close friends in the group. The group is also working on designs for the Cornell Theme Park Design Competition this spring and intends to participate in the Walt Disney Imaginations challenge in fall 2018.